Updated Clock logic and HMI screen simple and well documented. To use this, 'Import' this 'Toolchest' Drawer file into your PMC's Toolchest. Then 'Copy' one of the Ladder Blocks into your 90-30 or PAC Rx3i Target by holding down the Ctrl key while drag-n-dropping it onto the 'Program Blocks' in the Navigator window. The QuickPanel Screen along with the 'Indexed Message Grid' can similarly be brought into your QP or QP+ Target. If there is already variables in your project you may need to adjust some or all of those used here. 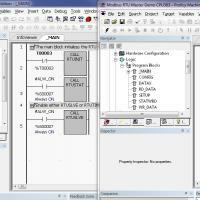 The logic here also will help you to understand the Array_Move Function blocks in PME. There are two Proficy ME projects in the zip file one for VersaMax and one setup for 90-30 CPU364 but is the same for all of the 90-30 processors, but read the Manual GFK-2220 to get the correct port information for your CPU and configuration. They are both working and well documented. They were done quite a while ago but I do not recall what version of PME is needed to open them. It is my recommendation that we all use the latest version. Here is a simple code for 90-30 using single input to control 2 different outputs with alarm point. Such as alternating pumps. This code assumes one pump will run always.<br />I use LM90 software. Should be able to import to others. Attempt at getting RS-232 port on 363 CPU to receive serial data from PC. This is a complete program written in GE VersaPro 2.0. Features a walking beam testing machine with six stations. Bit shift tracking is used to track the product through the test machine. This is a whole assembly machine. There is a ton of example stuff in here. Everything from load cells to vision system integration to IAI Servo systems. This is the standard way to get the time out of a GE PLC. This was pretty much taken straight from the manual but with some added time pulses. The program was written in LM90 but the file is a Word 97 version of the printout. Take a look.